This is a case that has generated so much euphoria among those who have seen the action of GTBank as a very wrong one. There have been reports and counter reports concerning this case which has even reached the table of the EFCC. EFCC was at some point invited into the case by GTBank, and the agency has invited Chief Innocent Chukuma over for interrogation. In the last case even GTBank denied the report from the Appeal court and called it media propaganda that has no weight. The Republican News gathered from the social media account of the Innoson Vehicles a press release made available to the public. Here is the press statement from Innoson Vehicles Manufacturing, IVM, company. However in an ruling delivered by Honourable Olabode Rhodes-Vivour JSC on Wednesday, February 27th 2019, the Lord Justices of the Supreme Court (JSC) dismissed GTB’s appeal and thus affirmed the concurrent judgment of both the Court of Appeal and the Federal High Court, Ibadan Division which ordered GTB by way of Garnishee order absolute – to pay N2.4 Billion to Innoson with a 22% interest, per annum, on the judgment until the final liquidation of the judgment. The Judgment debt of N2.4B has an accrued interest as at today of about N6,717,909,849.96 which results to about N8.8 Billion. This is now a very serious issue for the bank and one wonders why the bank has found it difficult to settle such debt. What does your victory at the Supreme Court mean to the PDP? The victory was celebrated across the length and breadth of this country, even beyond the Peoples Democratic Party. That shows you that the PDP, even in its present shape, is what Nigerians are really looking forward to having in power again. They can see the light at the end of the tunnel. We are wooing members from other political parties, even if they are not partisan, to join the PDP in order to return to power in 2019. Our victory has signalled the end of the crisis. Prior to this victory, the sign was there for all to see. Let us consider the Osun West Senatorial election where the factions in the PDP came together and buried their differences and eventually won. This is a state where the All Progressives Congress controls. Look at the margin between the PDP and the APC candidate. That was a warning shot to the APC. The Osun election victory shows the PDP will win in 2019 and that many Nigerians still love the party. This is the beginning of other victories yet to come. Governors like Nyesom Wike were in court and expressed happiness with the judgement. We have not heard any PDP governor coming out to deny the judgement or doing anything contrary to the unity plans. We are appealing to all aggrieved members to come and join hands with us and let us reform the party together. This judgement is good for democracy, good for Nigeria and also we should learn from our past mistakes and provide better leadership than we did before. It’s not as if we should not be proud of what we did before, what we did before surpasses what is being done now, but we need to do much better. The sacked national chairman of the Peoples Democratic Party, Ali Modu Sheriff, said he was shocked by the Supreme Court judgement which affirmed the leadership of the caretaker committee headed by you. What is your take on this? I don’t really know what he means. Only Sheriff can tell us what he means by being shocked. The fact is that, in pursuing justice anywhere in the world, you can’t be so sure of the outcome of your case in court for a number of reasons. Many technicalities can arise. Even when one has a good case, one can still lose in the court. That happens a lot. We pursued this case it to a logical conclusion because we were sure of our facts and we had a team of good counsel. Despite that, we could not say hundred per cent where the pendulum was going to swing. If one wants to predict the outcome of cases, then it means such judgements had been determined before the conclusion of the matter. Maybe that was what he was expecting but I don’t know. Why do you think that Sheriff lost at the apex court, having won at the appellate court? Do you think there is a problem with the country’s judiciary? The judgement of the Supreme Court is a 93-page document. I have not seen the full judgement not to talk of reading it. I believe the reasons for losing the case are contained in the document. For anyone to know why one has to get the total pages and the facts. This is the Supreme Court, the plenary must have reasoned through and analysed the facts before them. I don’t think we should question the judgement of the apex court. The jurists have done what is right. He has not congratulated me personally. I don’t think he has reached out to any of us. But I have read in the news (papers) that he issued a statement congratulating the party. I read about that but I have not spoken with him. The All Progressives Congress said it was not threatened by your victory? If they felt threatened, of course, they won’t say so. They won’t say they are frightened. By saying they are not threatened, that shows you that they are really frightened. There are times when someone says no, he means yes. What is your immediate agenda for the party? We have plans to pursue a reconciliation and accommodation agenda immediately after the judgement. We are pursuing rigorously a genuine reconciliation of all aggrieved members. I have been talking to many of them. The fact that we disagreed politically does not matter. We intend to set up a small team of credible people to deal with that. Our reconciliation plans cover not only those who sided with Sheriff, but other aggrieved members who developed cold feet or moved to other parties as the case may be. We are also working on an aggressive campaign to recruit new members into the party. After the judgement, has any strong PDP member who joined the APC reached out to you or planning to come back to the PDP based on the victory? Yes. I would not want to disclose their identities. Some of them have been in touch. That is all I will say on that for now. Will there be an expansion of the executive for now to accommodate other aggrieved camps? The focus now is the immediate reconciliation plans and to get a calendar for a convention where people will freely elect their permanent leaders for the party, at least for the next four years. Our tenure as the caretaker committee is limited and temporary and we don’t plan to stay beyond the period. How soon will the PDP convention take place? Only the national executive council (NEC) has the powers to decide that. That is beyond the caretaker committee. But NEC has not decided on that yet. I am sure they will soon meet to determine that. Will you step aside or contest the party chairmanship during the convention? I am not going to contest any elective position in the PDP. That has never been part of my ambition. What if the NEC asks you to be the chairman? There is no such plan. There is nothing like the imposition of candidates again. The position of the chairman is an elective position. The party members will decide who will be their next national chairman at the convention. To contest is a personal decision. I wouldn’t consider myself as the best to administer the PDP. The caretaker committee was an emergency response to save the party. I am happy I did my best. Based on allegations of financial misappropriation, will Sheriff be probed? We have no reason to probe Sheriff. There is absolutely no reason to probe anybody. We are not a vindictive set of leaders. We are refined set of leaders. Our plan now is to unify the party and make it stronger. Has the agreement to cede the national chairmanship to the South-West changed? Don’t forget that the national chairmanship was zoned to the South, not the South-West specifically. If the South, in general, deems it fit to cede it to any of the geopolitical zones in the South, no problem. The zoning structure of the PDP runs based on north or south. The battle for victory was a prolonged one. What lessons have the victory taught you and other PDP leaders? The lessons we learnt through the crisis is the need for an amendment of our constitution to make it more authentic. We need to block certain loopholes so that anybody who has a little disagreement with others won’t hold the party to ransom. We have learnt our lessons and will deal with the issues that would facilitate and encourage in-house resolution of conflicts without going to court. Who are the prospective presidential candidates of the party for 2019? It is an open race. Any card-carrying member that meets the electoral requirements is free to contest. You cannot exclude anybody; it is for the party members to say this is who we want. Will the PDP woo back the Senate President, Bukola Saraki, and a former Vice President, Atiku Abubakar, and other strong PDP members who defected to the APC? We don’t really have to woo anybody. It’s a personal choice. If they make up their minds to join us, we will accept them. Of course, there will be no special condition or treatment for those planning to come back to the PDP. I can assure you that there will be no preferential appeal to anybody or group of persons. The appeal will be general. We will reform the party and make it more democratic, thereby creating level playing fields. Don’t you think the PDP needs bigger politicians in its fold? We have many big people in the PDP already. We don’t lack big people. It’s not a matter of big people. Even if you are small, but you have the capacity, you should be given the chance. We are not going to do anybody a favour or give special treatment to any contestant, whether Saraki or Atiku if they defect and meet the party’s conditions, they can contest. The PDP constitution has stipulated conditions to be the party’s flag bearer, no one can deny anyone that if you meet the position. You talked with great assurance that the PDP would come back to power in 2019.With an almost collapsed structure, how will this be possible? We are more serious about the restructuring of the country. Remember that the PDP was the first to address a world press conference as a political party and talked about restructuring, the kind of restructuring we need and to design modalities on how to go about it. It was after the press conference that series of conflicting statements started emanating from different parts of the country. We have set the pace on this. We know that restructuring means different things to different people. The number one thing to do in such a situation is to sit down together, to discuss and agree on the restructuring we want. Restructuring can be political, territorial, economic or others. Already we are looking ahead. We have set up the Jerry Gana committee made up of over 250 people. We have a report that covers all aspect of reforming the party so that internal democracy is established. Now that we have victory, we are in a position to hold regular NEC meetings, and the NEC would consider the Gana report. Whatever the NEC approves, if it requires a constitutional amendment, administrative guidelines, in order to effect the needed changes, I am sure they will be addressed. Do you think Sheriff will join the APC? Remember that Sheriff came from the APC. We won’t be so surprised if he joins them. If he returns to the APC, we will also pray that those who left the PDP should return to the PDP. The equation will be balanced. How can you quantify the loss of the party during the legal tussle? There was not much loss. Is it not just to pay legal fees? Legal fees were contributed by party men and women who have the party’s interest at heart. We are grateful to them. The PDP was broke and could not complete its new national secretariat, when will it be completed and how will it be funded? Party men and women will contribute towards that. Well-meaning Nigerians willing to contribute are invited to donate. Only God knows. But from what I can see, the most likely outcome is that the PDP will return to power. Have you reached out to former President Olusegun Obasanjo since the Supreme Court victory? We cherish the legacies of former President Olusegun Obasanjo. He is a father to many of us. Whether he is in the PDP or not, we will continue to honour him and hold him in high regard. We will never forget his legacies and the services he rendered to this country, not just as president but as a party leader. What next for you in politics after relinquishing your position as caretaker committee chairman? I never aspired to be the chairman. I am not the kind of person with a personal agenda. I am a party man. After this position, I will continue to contribute my quota to my party. A former Minister of Aviation, Femi Fani-Kayode, said the president will never come back alive. Do you think so? I am not God. Nobody should play God on President Muhammadu Buhari’s health. He may come back, he may not come back. I am not in a position to say. I cannot play God. If anybody chooses to play God, that is their personal decision. That is his personal opinion. I don’t know his current state. I cannot advise him based on what I read. He knows his state of health. Those in government should know better. Should he declare his health status? Chairman, National Caretaker Committee of the Peoples Democratic Party ( PDP), Sen. Ahmed Makarfi, on Wednesday afternoon, resumed at the party’s national secretariat, in Abuja, after the Supreme Court validated the sack of Sen. Ali Modu Sheriff as the party’s leader. Makarfi arrived the secretariat in the company of members of the committee and other top notchers of the party few minutes after the apex court quashed the judgment of the Appeal Court, Port Harcourt Division that declared Sheriff as the ‘authentic’ national chairman of the PDP. Party chieftains present at the Secretariat included Governor Ayodele Fayose of Ekiti State, Deputy Senate President, Sen. Ike Ekweremadu, former ministers, among other party stalwarts. 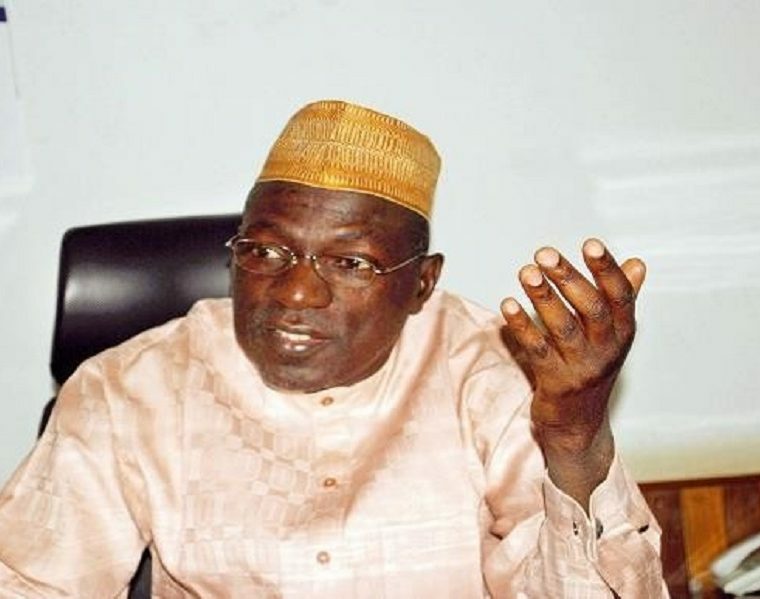 Addressing a crowd of party faithful that thronged the Wadata House, Makarfi said the Supreme Court judgment was a victory for all members of the party, noting that there was ‘no victor and vanquished’. He said the legal battle the caretaker committee fought in the last was a battle for the sustenance of democracy in the country. The PDP leader extended a hand of fellowship to members of the sacked National Working Committee (NWC) led by Sen. Sheriff, noting the caretaker is committed to reconciliation in the party. However, he noted that the reconciliation must be based on equity and justice. According to him:”The battle we fought was not a battle for PDP alone. It was a battle for democracy, it was a battle for supremacy of party men and women to decide their destiny. And it is a battle to do away with dictatorship in political parties and this will never repeat itself. “There is no victor, there is no vanquished. We must be open to reconciliation. But there is a caveat: reconciliation does not mean we take what belongs to people and give it to you. Reconciliation must be based on equity, equality and values. Makarfi said the caretaker committee will consult with the relevant organs of the party within the next two days and come up programmes on how to move the party forward. On his part, the National Legal Adviser of the party, Hon Dave Iorhemba told journalists that the Supreme Court judgment is a victory for democracy in the country. The Supreme Court has declared Ahmed Makarfi the authentic chairman of PDP. The legal case that has dragged on from the lower courts through to the Appeal Court and finally to the Supreme Court has finally ended in favour of Makarfi faction of the party. The five-man Supreme Court judges panel came to a unanimous decision in their verdict and that seals the fate of the party, as it declares Ahmed Makarfi the real chairman of the party. This is now the end of the road for Ali Modu Sheriff’s faction of the party. He has exhausted all his chances and the apex court of the land has made its decision. There is wild jubilation in the Supreme Court in Abuja right now. This could be the comeback that PDP needs since APC has proven to be a failure in all ramifications and has lost the goodwill of many Nigerians. Now, the party could put its house in order or be the old party and blow their chances in elections ahead.